A couple of months ago I went home for an event that I was attending with my mom. I watched her get ready, always perfectly put together of course. She has a very specific makeup routine that she rarely strays from. Me on the other hand, my skin + makeup regimen has been aaaaaaaaall over the place since I switched to organic. Finding the balance between light coverage, full coverage, no coverage? Do I still need, or even want to wear eyeliner every day? If I could have put the clown face emoji on my head, it would have felt entirely accurate. Granted, by normal makeup standards I'm sure I looked completely fine. In the age of contouring, a trend that I just never had the patience or understanding for, everything I had piled on would in no way be seen as a clown face. Here's the thing though, I had been going for months with such minimal makeup, taking better care of my skin, and really loving what my skin looked like without a heavy layer of full coverage, that seeing anything more than that just didn't look like me anymore. I went back to the other bathroom, scrubbed it all off, put on about half the amount of what I had previously, and breathed a heavy sigh of relief at the finished look. It was in that scrubbing off the layers of makeup moment that I realized less is definitely more when it comes to my beauty routine. Once I realized that wearing a full face is not usually going to be an everyday thing for me, and since I've majorly cut down the quantities of what I'm using, I went on the hunt for a more luxe organic brand. 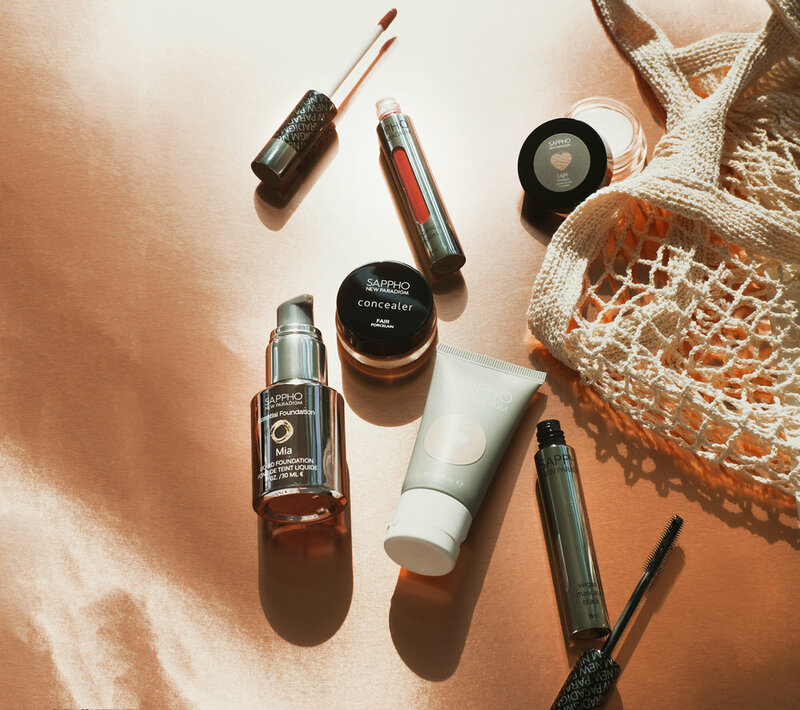 Whether you're into wearing a lot of makeup, or just a little bit... or maybe you just don't know where to start on this whole organic makeup journey... I cannot recommend trying Sappho New Paradigm enough. I discovered Sappho products via the Detox Market, specifically the essential foundation at first. The Detox Market is an incredible resource for makeup, skincare, and wellness products. Its been my go-to recently to find products that align with the more conscious decisions I'm making involving skin and beauty. 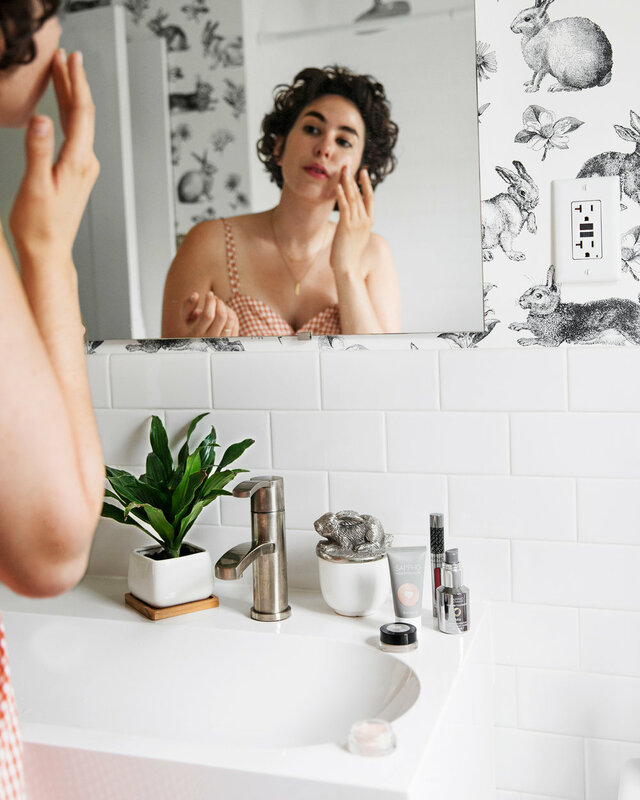 The reason I'd recommend this if you're just starting your natural beauty journey, is because it's so in line with the quality and luxury of makeup options we're used to seeing at Sephora. Just because it's organic, doesn't mean it can't look chic. The products don't have any of the caveats I've noticed with some other organic makeup. I know many people, including myself have often felt frustrated with the texture, or had coverage issues with certain natural products. I'm happy to report I've yet to have any with these staples from Sappho. Using the full range of products I've featured is what I've been leaning towards when I'm craving a little extra zhoosh, while the essential foundation and shimmer seem to be perfect for an every day bare beauty look. Everything has felt great on my skin, and in line with my previous higher price point / non-organic makeup buys. Moving into an easy breezy summer beauty routine, I know these will never be far from reach.